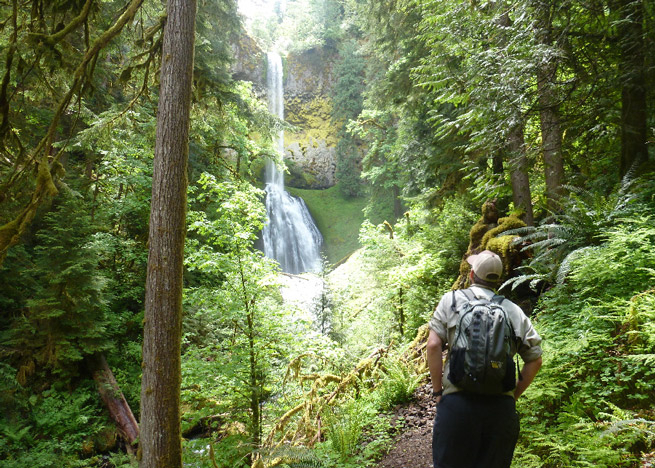 Spectacular Pup Creek Falls will be the destination on this hike from the Fish Creek Trailhead. The mighty Clackamas River and the boaters on it are an attraction in itself, and the old growth trees, beaches and wildflowers make this an ideal trail in any season. The moderately-graded Clackamas River Trail winds along the river from pebbly beaches to cliff-tops through Doug-fir forest. Join our experienced guides and learn more about the flora, fauna, natural history and Oregon's amazing waterfalls while basking in the splendor of Pup Creek Falls.